Currency only valid for regional use. Currently, Somaliland is an unrecognized state. This means that no country with membership in the United Nations or international organization views Somaliland as an independent country. Instead, they think Somaliland as a part of Somalia. Somaliland has a republican government with free elections. The capital is Hargeisa. Berbera is a beautiful city on the coast. 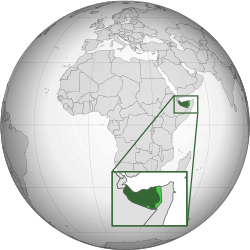 People from Somaliland are often criticized for their country having declared independence from Somalia and working as an independent state. However, the country is much more peaceful than Somalia, has its own functioning market economy, and is not burdened with high tax rates, unlike other African countries. Some Dhulbahante people in the east have rejected joining Somaliland. These Dhulbahante created their own movement called Khatumo State. ↑ 3.0 3.1 Lacey, Marc (5 June 2006). "The Signs Say Somaliland, but the World Says Somalia". The New York Times. Retrieved 25 December 2010. ↑ "Somaliland Official Website". somalilandgov.com. Retrieved 23 December 2010. ↑ 6.0 6.1 6.2 "THE CONSTITUTION OF THE REPUBLIC OF SOMALILAND" (PDF). International relations and security network. 31 May 2001. Retrieved 23 December 2010. ↑ "Background Note: Somalia". U.S Department of State. Retrieved 23 December 2010. This page was last changed on 21 January 2019, at 04:20.